Two weeks ago in a room in Kabul, Afghanistan, I joined several dozen people — working seamstresses, some college students, socially engaged teenagers, and a few visiting internationals like myself — to discuss world hunger. Our emphasis was not exclusively their own country’s worsening hunger problems. Rather, tmhe Afghan Peace Volunteers, in whose home we were meeting, draw strength from looking beyond their own very real struggles. We looked at U.N. figures about hunger in Afghanistan, which show malnutrition rates rising by 50 percent or more compared with 2012. The malnutrition ward at Helmand Province’s Bost Hospital has been admitting 200 children a month for severe, acute malnutrition — four times more than in January 2012. Local governments push for Pentagon spending cuts. According to the Stockholm International Peace Research Institute (SIPRI), the United States currently spends more than $711 billion per year on military expenditures, which is – by far – the most of any country in the world. In fact, if one were to combine the totals of the next fourteen nations on the list (China, Russia, the United Kingdom, France, Japan, Saudi Arabia, India, Germany, Brazil, India, South Korea, Australia, Canada, and Turkey), their combined amount is similar to the USA. All together, the USA provides about 43 percent of worldwide military costs, and in addition, the USA per capita ($2,240) and percent of Gross Domestic Product (4.8 percent) in relation to military funding is far greater than any other nation in the world. With these statistics in mind, one is provoked to ponder some important questions. For example, what is revealed to us about the USA – and our world in general – when military expenses constitute such a significant percentage of a government budget? In contrast, the budget for UN Peacekeeping operations for fiscal year July 2011-30 June 2012 is about $7.84 billion. That’s 0.5 percent of what the world spends on its militaries. It’s a stark example of the world’s misguided priorities. Robert Baer speaks at the 'Spies Like Them' panel discussion at the 2007 Tribeca Film Festival. Photo by Getty Images. A recent Gallup poll shows that 81 percent of Americans want the President to be focused on domestic issues, while 9 percent say they want him to focus on foreign policy issues. Not too surprising ... until you consider that the fastest growing domestic priority is the deficit (69 percent). The lopsided number between the importance of the deficit and the importance of foreign policy is the first clue that, for most Americans, there’s a disconnect between domestic policy and foreign policy. Clue number two is a bit more alarming. The same poll indicates that 54 percent favor a “strong” stance — read: military attack — against Iran versus 39 percent who say that it’s more important to avoid a military conflict with Iran. Put these facts together and a disturbing picture emerges: the less Americans care about foreign policy, the more willing they are to go to war, and the less they’re able to see that war = skyrocketing deficits. The disconnect couldn’t come at a worse time. If the GOP primaries were like Old Country Buffet, I’d be happy. Think about it. There wouldn’t be so much money involved and we could pick only the stuff we liked and ignore the rest. And of course, everyone knows the basic rules of smorgasbord grazing, such as you can’t get decent sushi in the Midwest or proper social conservatives from Massachusetts. President Barack Obama made an unusual appearance in the Pentagon briefing room Thursday with Secretary of Defense Leon Panetta to release a new Defense Strategic Guidance, essentially the strategic plan for the U.S. military. Recognizing the end of the war in Iraq and the pressure of deficit-driven budget cuts, the plan outlines a smaller and more focused military. On Saturday, November 12, at 8 p.m. ET, CBS News and National Journal will present a nationally broadcast debate focused on national security issues. There are several ways for you to participate both before and during the debate. Our friends at WAND (Women's Action for New Directions) have created a primer about how you can submit questions to the candidates before the debate. "For every 5 percent drop in income growth in a developing country, the likelihood of violent conflict or war within the next year increases by 10 percent. Poverty-focused development assistance supports economic growth, protects vulnerable people, and helps curtail desperation that may lead to violence" (Bread for the World). On Wednesday, the Senate will vote on the budget for foreign aid. Should the proposed cuts occur, it would prove disastrous for the rest of the world, potentially leaving millions without food, education, and livelihood. Please, contact your Senators today and tell them to continue funding poverty-focused development assistance. 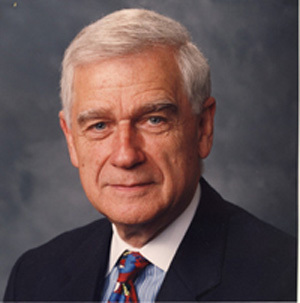 Mark O. Hatfield's political witness shaped a whole generation of students, teachers, pastors, and social activists in the evangelical community and beyond. The voice of Christians today who plead for social justice and peaceful alternatives to war would not have emerged with its strength and clarity in the 1970s without his leadership. His death underscores the vacuum of such spiritually rooted voices uncompromising in their commitments to peace and justice within the cacophony political rhetoric today. One of my life's greatest privileges and joys was to work as an assistant to Senator Mark O. Hatfield for nearly a decade, from 1968 to 1977. I saw first-hand what courageous leadership, combined with unswerving compassion and civility, looked like within the political life of that turbulent and formative era. Those experiences are shared in my book, Unexpected Destinations (Eerdmans). In the past two years, the social safety net has helped more Americans than any time in a generation. So why are so many people trying to tear it to shreds? Tough choices are now upon us -- but they must be smart, courageous, and compassionate. On April 14, Jim Wallis attended a press conference on Capitol Hill. I had the opportunity to interview Ben and Jerry's co-founder Ben Cohen about ice cream, Oreos -- and how the bloated military budget is destroying our economy and making us all less secure. Like all of you, I was stunned some days ago as I started soaking in the breaking news of Osama bin Laden's capture and death via U.S. military operations. What is the Circle of Protection? Yesterday, the leaders of more than 50 Christian denominations and organizations drew a line in the sand of the budget debate, and asked our political leaders to do the same.